What are the best kinds of fish to get? Is salmon a good choice? Is it okay to only eat salmon? Which fish are best eaten raw and which are best eaten cooked? If needed, how does one cook fish? How much fish should I be eating daily (esp in the context of a diet that is high in fruit/veg)? No "eat a steak" posts please, thank you. Thanks! I got 2000 cals in yesterday. Breakfast was 1 papaya and 1 mango. Main meal: 2 fillets mackerel oven-cooked in coconut oil, lemon & herbs, plus a large plate of veggies sautéed in coconut oil. Snacks: Large handful of hazelnuts, punnet of blueberries, green tea & coconut oil, coffee & coconut oil. Thanks! I got 2000 cals in yesterday. Breakfast was 1 papaya and 1 mango. Main meal: 2 fillets mackerel oven-cooked in coconut oil, lemon & herbs, plus a large plate of veggies sautéed in coconut oil. Snacks: Large handful of hazelnuts. Punnet green tea & coconut oil, coffee & coconut oil. Have some more food at brekkie. This is looking amazing, Pecan! I can't eat mayo (eggs) but I like this sardine wrap idea! Also, I found sardines imported from Portugal and they are far less offensive. I'll never buy cheap Canadian sardines again. OMG they're foul. Dude. It's crazy good. Total fat bomb. I had some as part of breakfast a while back and I got full FAST! Just fried up some salmon with lemon slices, coconut oil, salt and herbs, as per primalpat's suggestion. Wasn't as bad as I thought! Apparently you shouldn't pair fish with fruit, though (see raydawg's answer below). Thanks for the tips. Dan, how long did you ferment the kefir? It needs 24 hours to get rid of lactose, and also you need to start slowly with it until you get used to it, no more than 1/4 cup the first week. Some info about fish broth: http://paleohacks.com/questions/148850/what-is-the-ideal-fish-for-making-fish-bone-broth put the heads in there too! It's not a bloody beef steak. Chicken and bacon I suggested because they're less "meaty" or "further" from the actual source. Not because their the epitome of of animal product/nutrition. I love liver, but putting it in a blender would make me not want to eat it. Liver is delicious. I wish you guys would stop with the joking about bacon and land animal meats somehow being higher up than seafood. It's just bacon, guys. I would have to disagree about staying away from tuna. Good quality tuna definitely has its place. There's tons of soy-free tuna out there. Also, when in doubt, buy a raw tuna steak. That's a very good point - make fish stock! You can also use shrimp shells and things in it. Also, I eat cow or chicken liver about twice a month, which is the only non-seafood meat I consume. It gives me great energy for 1-2 weeks. Also, I can vouch for the sheer awesomeness that is OYSTERS. Also, I like beginning my sentences with "Also, ..."
Great response. Two things: Speaking as a paleo-pescatarian, I once tried doing raw, local, organic goat milk kefir, and I *still* had sensitivities to it similar to with other dairy products. Not sure why. Also- can't bone broths be made with fish carcasses? I wish I could find the reference, sorry, but off the top of my head, the issue is omega 3s and fructose. cod liver pate sounds awesome! i drink the oil, but haven't tried this before. i will have to order some. yeah, i understand. i was always a big china study worshipper and thought all this added meat was gonna rot in my colon. i've now learned that the body is really efficient at digesting meat and what usually ferments is carbs. go figure. the one cooking technique i've found helpful with fish is to put a lid on the pan as it cooks. i flip it mid way through, but leaving the lid on lets it steam a little and keeps it moist. i made a lot of charred fish before i figured that out. Oh, didn't realize you were in Ireland. I'm not an expert, but I'd guess Ireland should be an easy place to get wild caught fish. I think salmon is a perfectly good fish and a great place to start if you already know you can handle it, but I wouldn't shy away from branching out over time. The variety will likely be good to: (1) make sure you're getting all the nutrients need, (2) avoiding overdoing on any toxin that might build up in a specific type of food and (3) making your diet more sustainable by avoiding monotony. Hmmm. I've never eaten liver before but it's always grossed me out. If it is so healthy, though, perhaps I can be swayed to at least try it. I will research more, thanks. Frying fish in a pan with coconut oil shouldn't be too hard. I fry everything else that way, after all! I find the idea of eating meat really daunting. It'll sound stupid and it is, but one reason why it's so hard for me to make the transition is that I feel I have abstained from meat/dairy for so long, it took a long time to eliminate them from my system and re-introducing ruin all my "hard work". I suggested salmon because I've heard it's very healthy, and I was able to tolerate it more than other meats as an omnivore. I'm not sure if I can get Trader Joe products in Ireland, but I will have a look. Thanks for your help! Thank you for the very thorough response and additional tips. Some very helpful information here. I've considered eating oysters/bivalves on the recommendation of Denise Minger, however they're a bit out of my price range. Maybe I'll eat them as an occasional indulgence (apparently you only need to eat a certain amount every month to reap the benefits, though?). I'm afraid the very idea of bone broth makes me want to throw up! Interesting about the kefir, I'll look into it. +1 for bacon is a vegetable. What are the best kinds of fish to get? 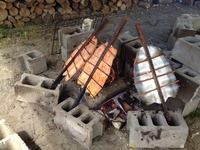 Wild salmon, wild sardines (canned), smelt (eat the whole fish, with heads and guts, fried), cod, rockfish. One thing that people forget to suggest around here, that is possibly MORE important than fish: shellfish. Especially oysters and mussels have way more nutrients (or quantity of specific nutrients) than any fish. Definitely eat shellfish once or twice a week, especially oysters/mussels. Additionally, oysters/mussels have no nervous system, so from that point of view, they're even more vegan-friendly than fish. Is salmon a good choice? Is it okay to only eat salmon? No. Not a single fish can provide all the nutrients. For example, canned sardines, when eaten with its soft bones, will provide calcium. And of course, let's not forget shellfish... And even then you would still be short on some other B vitamins. Use Cronometer.com to measure what you're missing. Which fish are best eaten raw and which are best eaten cooked? Everything can be cooked. Salmon is great raw though BUT it has to be marked as "sashimi quality". If not, it must be cooked. If needed, how does one cook fish? Just fry it on coconut oil for a few minutes (both sides), until cooked-through. Add some salt, pepper, lemon. Or you can bake it in the oven with veggies and some oil, herbs. For the shellfish: 1 tablespoon butter, 3 minced garlic cloves, some chopped parsley. Fry until cooked through. You can also later add some tomato sauce and pour it over baked spaghetti squash. For the cod liver: it's EXTREMELY smelly when fried. I personally like it better right out of the can, with some lemon (each can has 8 portions, don't eat it all at once). How much fish should I be eating daily? 150 to 200 gr of fish or shellfish daily, I'd reckon. Again, you can use Cronometer.com to input what you eat in order to see if you're missing nutrients. Bone broth. I know you don't want to go animal style, but maybe once a month you could boil some beef or lamb bone broth, which has gelatin and other properties not found on fish bones as much. Offal. No matter how much fish/shellfish you eat, you will NOT get enough CoQ10 and PQQ. These nutrients (very important for mitochondria, skin, gums etc), can be found in large enough amounts only in animal offal. So again, as with bone broth, maybe once or twice a month, you can make the sacrifice and eat some lamb liver or lamb heart. Treat that as your exception to your rule, just so you can recharge these specific nutrients, not as your "staple food". These nutrients don't exist in muscle meat btw, so you're still going to be away from eating "muscle meat" at least. If you go the supplementation route instead, make sure your CoQ10 is the Ubiquinol form (more expensive than Ubiquinone, but much more effective). Home-made goat kefir. Even if you decide to not do any other type of dairy, you might want to actually go for kefir. It is a true superfood, and 10x more potent than Greek yogurt in fixing your gut flora and repopulating it with the right stuff (and kick-starting the right enzyme production for you to properly digest meat or dairy). BUT. It has to be home-made (much more potent), it has to be fermented for up to 24 hours (no lactose problems), and it has to be from goat or sheep milk (no casein problems). Good luck! And don't forget to check your D3 via a blood test. It's as vital. Wild Salmon is perfect. I eat mostly Wild Salmon. Alaska Salmon should be Wild. Atlantic Salmon is usually farmed. I do eat Tuna once a week from Wild Planet. If you want to add things Oysters, Shrimp, and clams are other good things that you could branch out to later on. Great choice ot eat fish. Salmon is a great starting point. It's a popular fish for a reason! It is a stronger-tasting fish, though, so if you try it and aren't a huge fan at first, don't despair. Try something a little milder. Grouper and perch are pretty mild. You may also want to try freshwater fish - varieties would be more local to your area, but trout is one of my favorites here. Canned sardines are also great (BPA free if you can get them) and you can get the boneless and skinless in olive oil kind, at least to start, so you don't get squicked out by bones and things. Anchovies are great, too, but use a very light hand with them. I personally like all varieties of fish except catfish (just omg ew) and I only like tuna raw or from a can. I also agree with the tips about shellfish. Also, don't forget sushi, especially if you're okay with a little white rice. It's so light and refreshing, and has a very different texture from cooked fish. When it comes to raw fish, I would recommend only eating it in a restaurant until you are very comfortable with fish at home in general. When you are at that point, freeze everything for two weeks to kill any bacteria, and only use super-fresh before freezing, super high-quality fish. The fattier the fish, the better the sushi (that's why salmon and tuna are popular sushi fish). When it comes to cooking fish, pan-sauteeing/frying and broiling are my favorite methods. Sauteeing on the stovetop with coconut oil or bacon fat, and broiling with EVOO or butter. For stronger fish, you can go with stronger herbs and spices like jerk or blackened, and for milder fish, something like a touch of dill and garlic is all that's needed. Play with it! Try to avoid overcooking it. Fish is done when it is opaque and flakes (salmon is often served slightly under, with a touch of translucency towards the middle). Many people enjoy a touch of acid, like a dash of vinegar or a squeeze of citrus, on their fish as a finish. Start with salmon. Heck make salmon cakes or something similar from canned salmon, make it less animal-like, so that you can get over the can't-eat-animals hangup. Shellfish are probably good too, like shrimp or scallops. I know others are suggesting sardines, but that's probably the worst thing for you to try, simply because it's essentially a whole fish, might be a little traumatic. Once you get the idea of eating these animals down, then try a fillet of salmon so you ease closer to the real product. Branch out into all sorts of fish then, and eventually you'll be ready for something like whole canned sardines. More seriously, I'm a fan of wild caught salmon, wild cod, shrimp, oysters, mussels, squid, octopus, etc... The canned stuff isn't too horrible, BPA is an issue, I tend to like stuff like smoked kippers, smoked oysters, clams, cod livers, squid/octopus, etc.. If you can, venture into some eggs too. The canned stuff is easy, if it's not in a friendly oil, put a couple of paper towels on a wide plate, squeeze out the oil from the can as much as possible, then pour out the fish onto the paper towel, wrap it around the fish, and put something heavy on top for a few minutes, then discard the paper towel. I do this with smoked oysters which seem to come in cotton seed oil. Stay away from tuna, and weirdly enough it seems the modern stuff comes packed with soy as well. Cooking the wild stuff, there's tons of ways, you can grill it, fry it, saute it, steam, etc. Follow the recipes you like. Salmon is very forgiving of overcooking, other fish aren't. Some of the tastiest is the simplest. Coat some shrimp in olive oil, salt, and pepper, then skewer them and grill until pink, then flip over and repeat for a minute. Or fry up some chopped garlic in butter, salt, pepper, and maybe a bit of olive oil at low temperature, and throw in some shrimp and gently stir until they turn pink, then turn off the heat and add some lemon juice on top and stir some more. Highly recommend getting good butter, something like Kerry Gold from US Wellness Meats. Beware of farmed salmon, especially now the stupid FDA approved GMO salmon. If it doesn't say wild, and it's not a ruby red, stay away from it. There is an issue with fructose and omega3's - if you eat both of these it can tend to lead to carcinogenic pathways since the n3's in fish oi are easily damaged, and fructose can easily form AGEs which are very reactive. So at least avoid eating fish close to eating fruit, and don't overcook fish, especially fatty cuts. You might want to switch to higher vegetable, higher fat, lower fruit instead of high fruit. -Seafood stews with crushed tomatoes. Slow cook whatever you have - clams, oysters, fish chunks - for hours with lots of garlic and oil. You can eat it as a stew or use it as a gravy over a starch such as sweet potatoes. -Grilled salmon with fresh pineapple slices. Fish almost always pairs well with acidity, like vinegar, citrus, or mango salsa, but there's something about the smoky grill flavor with the pineapple that's really tasty. Also, sardines can be tasty on a salad with arugula, pink grapefruit slices, grape tomatoes, purple onion with a dressing of lemon juice, olive oil and s&p. marks daily apple had a GREAT recipe of ceviche. This where the fish and seafood is 'cooked' in lime juice instead of with heat. I Loved it. Also, frozen shrimp are your friend! You can create a curry with red curry paste mixed with coconut oil sautee until fragrant, add coconut milk, coconut aminos, lime juice and fish sauce (red boat brand). Add in in your vegetables ( I usually use yellow bell peppers and onions) and then your shrimp. They cook fast! look into adding fish roe to your diet as well. You can get your start at a sushi restaurant, but you can buy them canned on the same aisle as the tuna. Poach some wild salmon filets in some coconut milk in the oven. You don't have to add enough to cover 'em. Only to come up half way. Add some lemon slices on top, salt and pepper. I usually cook this in a 400 degree oven for about 10 - 15 minutes. You can eat salmon just slightly underdone. It will still be a bit coral in the centre, but it should be flakey too. Fried shrimp in coconut oil is awesome. With a splash or two of coconut milk, and a handful of baby spinach. OM NOM NOM. Try to find cod liver pate. It's nowhere near as gross as it sounds. It'll be a very nice source of nutrients and fat. Look for it in a Euro deli. Mine was imported from Iceland, and had very few ingredients: cod liver, garlic, parsley and lemon juice, if I remember correctly. EXCELLENT dip for carrots or celery. Don't sweat the bone broth. Are you opposed to gelatin? You can buy it in powder form and add it to anything, even tea or coffee and you won't taste it. It's excellent for skin and joints. pecan, i have the same background as you, so i get how you feel. i was a vegan for 5 years before i introduced meat back into my diet. the first thing i introduced was tuna fish and then added shrimp, salmon, cod, swordfish, trout. i pretty much eat all fish now. i had to learn how to cook as well since i went veg. at 17 and never learned how to cook meat prior to that. it's really not that hard but it will take you a few times to get your techniques right. i honestly cook EVERYTHING in a frying pan with bacon fat or coconut oil. it's the fastest and easiest way i've found to cook. if you can get sauteeing fish down, then you will be fine. I'd say it's important to buy wild caught fish rather than farm raised. I think personally think pre-frozen is fine, and it can save you a lot of money. I'm not sure why you would limit yourself to just salmon. Try a different fish occassionally and see what you like more. You can fry it, grill it, put it in the oven. Trader Joe's has a decent variety of frozen wild caught fish at reasonable prices, and the packages often even have cooking instructions. You can of course also google recipes. Hopefully, you'll quickly learn to enjoy eating it and won't have to set an arbitrary eating schedule, but instead eat it whenever you feel like. Good luck. Lunch: 1 fillet salmon, fried in coconut oil, lemon and herbs. Steamed broccoli, carrots and onion. Handful of raw spinach and kale. Dinner: 1 fillet mackerel, baked in oven with coconut oil, lemon and salt. Spinach, brussels sprouts and zucchini. A little light on 1480 cals. Would usually have fruit for breakfast.